“Never Cross the Dead”, the 2nd full-length by Finland’s doom death duo, Hooded Menace, was my first trip into their unhallowed world. Even though that album struck me as a bit long in the tooth, the bands full bodied union of doom and death metal characteristics was a well produced and uniquely written aesthetic that burrowed down 6 feet deep with excellent riffage and a growling style that was bizarre when it comes to this genre. With Effigies of Evil, Hooded Menace continue on their deadly path, but one notices a touch more of a stoner doom/Sabbath/Rock element entering their dense tone, especially on the title track and “Vortex Macabre”. The detuned guitar sound and more spacious movement in the riffs seems unencumbered and puts me in mind of older Cathedral before the “oooohhhh yeeeaaaahhh’s” entered Dorian’s kooky delivery. 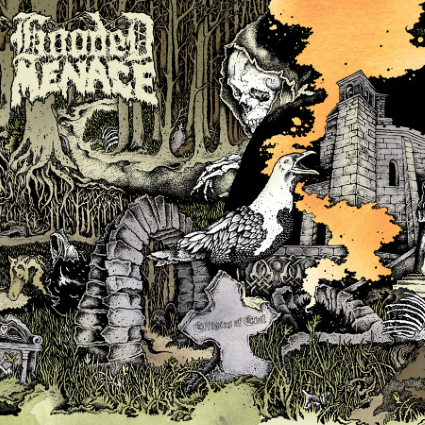 Other than more moment in the form of a rocked out vibe flowing through tracks like “In the Dead We Dwell”, Hooded Menace have stayed the corse and have worked even harder to make their songs more memorable and appealing to the ear. They do this with infectious melodies that soar high atop the riff foundations and even dip into some twin harmonies for more of a classic metal appeal. The solo work also mirrors this tasteful rock influence, but possesses enough of that sickly bend in the strings to embrace a vibe that puts me in mind of Paradise Lost (1st 2 albums). This influence feels quite buried, but peaks through the loping crawl just enough to let the listener know where Hooded Menace got the bread to put their butter on. Guitarist/Vocalist Lasse Pyykko’s growling style sounds like a long dead individual moaning for redemption from deep inside his sealed coffin. Where the music often takes on the spirit of having a lot of life and movement in it in spite of the death drenched sound, his vocals alone offer that miserable (in a good way) sense of hopelessness that suits this music perfectly. That and the fact that he avoids the Incantation brutalizations, or cupped mic ridiculousness and has found his own tortured delivery is commendable. ~ by martyworm on November 13, 2012. This entry was posted on November 13, 2012 at 8:06 pm and is filed under ALL REVIEWS, H-reviews.You can follow any responses to this entry through the RSS 2.0 feed.You can leave a response, or trackback from your own site.